I completed my first 5K race yesterday. This all started a few months ago, when my friend Kelly sent me a Facebook invite to sign up for the Shamrock Run with her as a team (yay for discounts!). I've never been inclined to participate in sports (or any other athletic activities, really) but for some reason when I saw her invitation I wanted to say, "YES!" ...And so I did. This 5K quickly became one of my goals (resolutions, new beginnings) for the year, since it fit perfectly with my word. and race packets at the Convention Center. The morning of the race, about to leave home. Jaymz made gluten-free pancakes for breakfast, and we all went together on the train to Waterfront Park where the race start was. 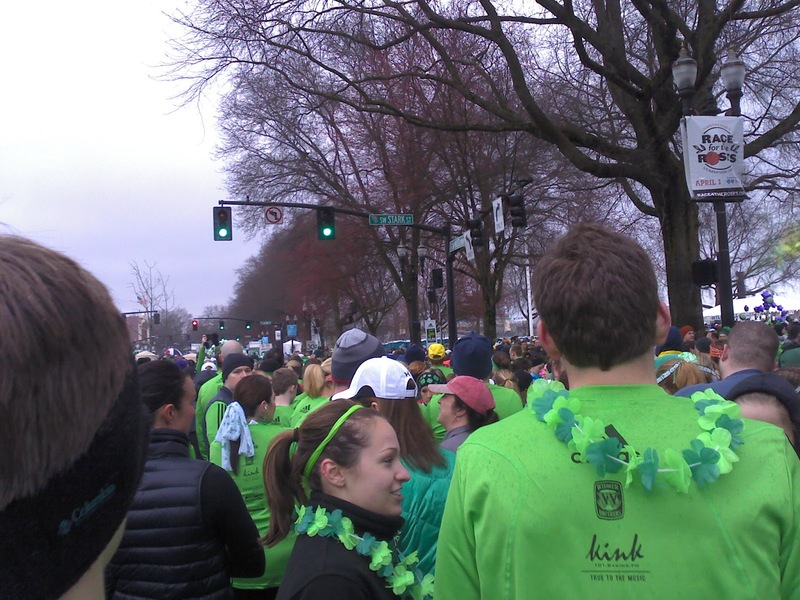 The train was downright packed with people wearing St. Patrick's Day gear and running shoes. Matthew said it was like the whole town got up today and decided to do this together. Jaymz helped me attach my chip to my shoe on the train. We walked the few short blocks to the park, and met up with the rest of the crowd. There were 32,000 registered participants in the various races and walks, which makes for a very crowded park! marked with the green balloon arch. I was glad we got there kind of early, because there was a huge line at the port-a-potties (again, thanks for the heads-up on that one, Kelly!) and I needed to go. Plus, it gave me time to get all wet and cold in the rain. About to leave to line up for the race! The other 5K runners and I gathered in the starting area and waited for the signal to go. Unfortunately, our race was delayed by the last of the 8K runners ahead of us; there were so many of them that we would've run into them if we'd have gone on time. The other 11,499 5K runners and I waited together and tried to stay warm. Eventually, we began walking, and then jogging, and then...we were running. The first mile went by so fast, I was surprised to see the mile marker. I ran straight through the second mile marker, too. After a while, I walked a couple of blocks, and then I alternated walking and running for about half a mile, then I ran the rest of the way. Near the finish line there was a backup of people, so everyone came to a quick stop before the final timing mats, and we had to walk through the finish (which screwed up everyone's recorded times). It was alright, though. Even with walking a little bit and the major slowdown at the end, I finished in 41:52, which I am very happy with. I was so glad to meet back up with Matthew, Jaymz, and Daniel. It felt so good to have finished the race and to see them smiling at me so proudly. I really enjoyed this experience. I might just have to do it again...or not—who knows! Yay! It feels so good to finish a race. We are going to a really big 10K at the end of the month. Something like 43,000 people I think? I'm a little nervous about navigating the crowd! Hooray for you! Isn't it the best feeling to finish something so huge? I used to do the shamrock run every single year, but haven't done it since having Bennett. I love the energy there. I miss it! This post made me REALLY miss it. Woohoo! You are so inspiring. I love your coordinating green hat, too! My first (and only! haha) was a fun run and it was only at 3K but I finished it too! I ran with my 3-year old and he did a better job at it, really. Running has become popular. Here in our country you'll find one left and right. People are such health buffs these days! Not that I'm complaining. And yes, I love your green hat too. Favorite color!